All eyes are on Rockstar Games this week as it prepares to release Red Dead Redemption 2 within a matter of hours. That said, there are still some fans wondering just when the next Grand Theft Auto will see the light of day, considering that the last iteration has sold nearly a hundred million copies. Well, if co-founder Dan Houser’s comments are any indication, we probably won’t see it anytime soon -- and a big reason for that revolves around the current Trump administration. While speaking with GQ in a recent interview, Houser noted how “thankful” he was that Red Dead Redemption 2 is coming out at the moment, instead of Grand Theft Auto 6. 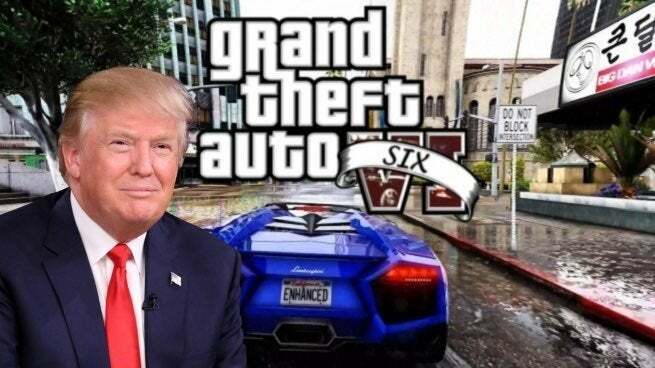 “It’s really unclear what we would even do with (GTA 6), let alone how upset people would get with whatever he did,” Houser explained when the subject came up. “Both intense liberal progression and intense conservatism are both very militant, and very angry. It is scary but it’s also strange, and yet both of them seem occasionally to veer towards the absurd. On top of that, it’s probably a good idea for the team to take its time on the next Grand Theft Auto iteration, so it builds upon the foundation that Grand Theft Auto V has set. And considering that game is still performing admirably well (again, nearing 100 million copies sold), there’s no rush to get a new game out there. But the focus is clearly on Red Dead at the moment, particularly with its Red Dead Online component, which is set to go into beta next month with a number of features intact. We’ll let you know more information on when that’s supposed to go live. Meanwhile, you can read Houser’s full interview here. It’s definitely worth the read. Red Dead Redemption 2 releases on October 26 for Xbox One and PlayStation 4.